The OSCE forms the practical part of educational and professional medical examinations and is often challenging and expensive. 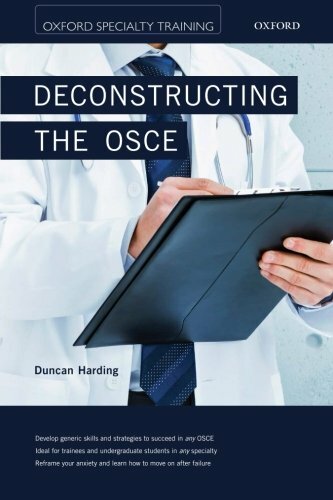 Deconstructing the OSCE takes a fresh approach to passing OSCE exams, teaching readers how to tackle the exam in a new way. This book doesn't provide checklists of information needed for specific OSCE stations; instead it helps readers to develop generic strategies and skills that will lead to success in any OSCE exam regardless of specialty or level. Packed full of advice, practical tips, real life examples and exercises, this book will prepare candidates with the skills to prepare for effective OSCE study and strategies for overcoming common psychological hurdles and baggage. It also explores how to overcome past failures in the OSCE by overhauling previous study routines and suggesting new strategies for the road ahead. Ideal for trainee doctors sitting PACES, CASC or other OSCEs, medical students, allied medical practitioners, nurses and medical practitioners from overseas, Deconstructing the OSCE is full of practical advice to increase candidates' confidence and improve the chance of success in any OSCE scenario.